We awoke to glassy waters, and were soon on our way. A pair of dolphins delighted us as we motor-sailed past the Salt Ponds, and the tantalizing smell of baking bread wafted into the cockpit until our propane ran out. Drats! Too bad for the dough Allan lovingly started yesterday. Note to self: we need to get a solar cooker and monitor our propane levels more closely! On the “plus side,” it was great to once again see the Chesapeake’s rich olive greens and aquamarine blues. For much of the morning, the water was mirror-like except wherever light winds ruffled patches on its surface. South of the Rappahannock River our biggest challenge was dodging floating seagulls, who resembled crab pot markers. With deep water and scant boat traffic, there was little to do other than alternate watch and verify our course every so often. 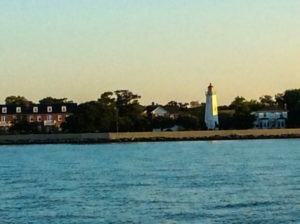 By mid-afternoon, as we approached the mouth of the Potomac River, the wind had picked up enough to whip up some white caps and boats were constantly within sight. The U.S. Coast Guard busily issued Pan Pans for a small boat taking on water, for another drifting after running out of fuel, and more urgently, for three people in the water. Fortunately, all were helped or rescued. 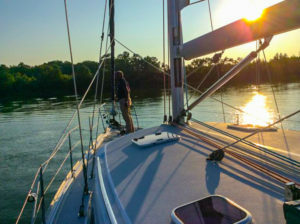 Nearly 12 hours after we set off, we dropped Vinyasa’s hook in Smith Creek, sharing a cozy anchorage with one other sailboat. One more day, and Vinyasa will be home, and getting ready to be hauled out for the season.